Amy is a cryogenically frozen passenger aboard the vast spaceship "Godspeed." She expects to awaken on a new planet, 300 years in the future. But fifty years before "Godspeed"'s scheduled landing, Amy's cryo chamber is unplugged, and she is nearly killed. 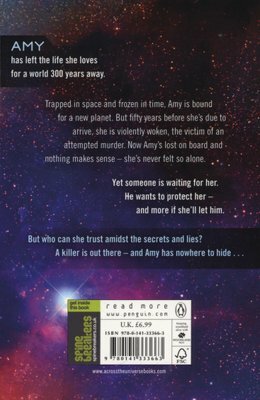 Now, Amy is caught inside an enclosed world where nothing makes sense. "Godspeed"'s passengers have forfeited all control to Eldest, a tyrannical and frightening leader, and Elder, his rebellious and brilliant teenage heir. Amy desperately wants to trust Elder. But should she? All she knows is that she must race to unlock "Godspeed"'s hidden secrets before whoever woke her tries to kill again. "Gripping first novel." - "Publishers Weekly"
"A compulsively readable crowd-pleaser." - "Booklist"